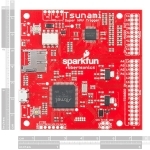 The Tsunami Super WAV Trigger is the next evolutionary step beyond the original WAV Trigger. 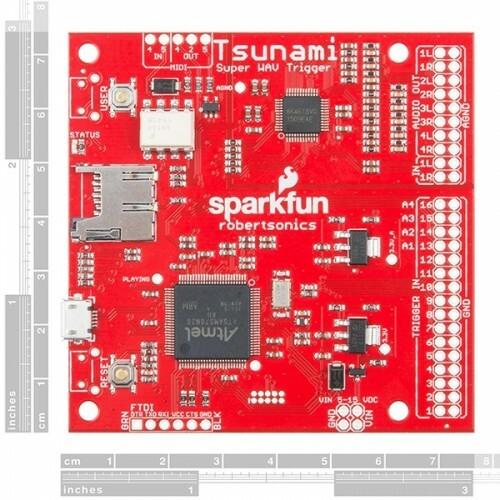 Based on a new generation ARM Cortex m7, the Tsunami extends polyphony to 32 mono or 18 stereo simultaneous uncompressed 44.1kHz, 16-bit tracks. Each track can start, pause, resume, loop and stop independently, and can have it’s own volume setting, allowing you to create the perfect interactive mix of music, dialog and sound effects. The Tsunami also supports true seamless looping over an arbitrary track length. 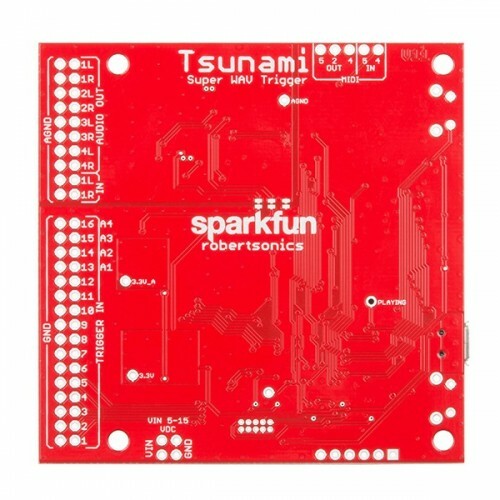 Each Tsunami Super WAV Trigger has a dedicated MIDI port with an integrated opto-isolator, making it easy to connect to any MIDI controller. 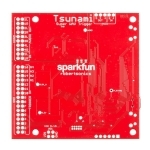 Tsunami’s MIDI implementation includes control of volume, pitch bend, attack and release times, and the ability to route any MIDI key to any of the output channels, as well as specifying single-shot or looping playback per key. Note: It is very important to know that this is a 3.3V device, and its inputs – including triggers and serial RX – are not 5V tolerant!